How to roast a pumpkin! I have relished in the fact that Halloween is thankfully optional in France here. Now, what to do with all that pumpkin? Although living in France has all its discoveries and indulgences, it takes a trip across town for a mere can of overpriced American pumpkin. Although I have made the recent discovery of pumpkin puree at Picard, the lifesaving frozen food emporium, it is a cinch to master at home. Bonne baking! *A spooky after effect of Halloween and a new I-PAD, excuse my serial killer handwriting. 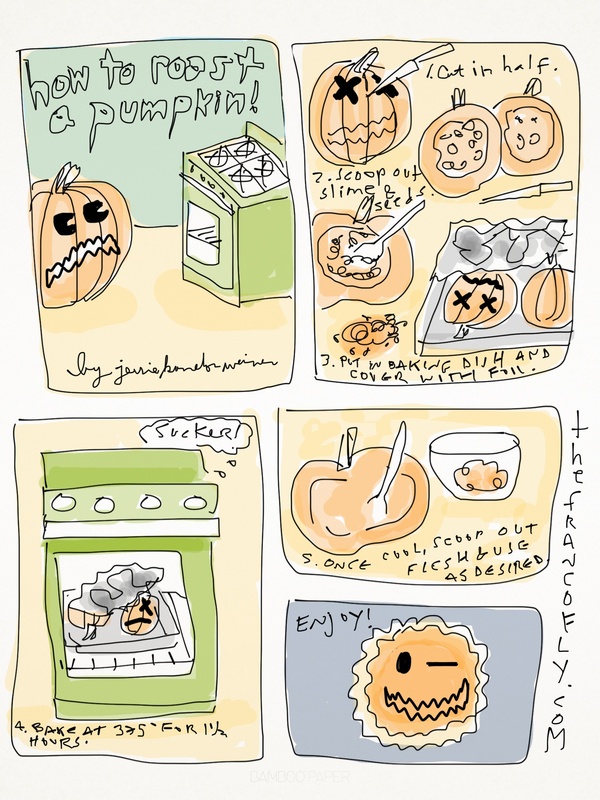 Freshly roasted/cooked pumpkin is always the best….can’t compare it with the canned at any price. Did you do you drawings on your new ipad? They are cool…to borrow an expression from another generation! Don’t throw the seeds away next time: wash and dry them for few hours, then toss with olive oil and some spices and bake for ten or fifteen minutes. Really tasty! Bonne journée!